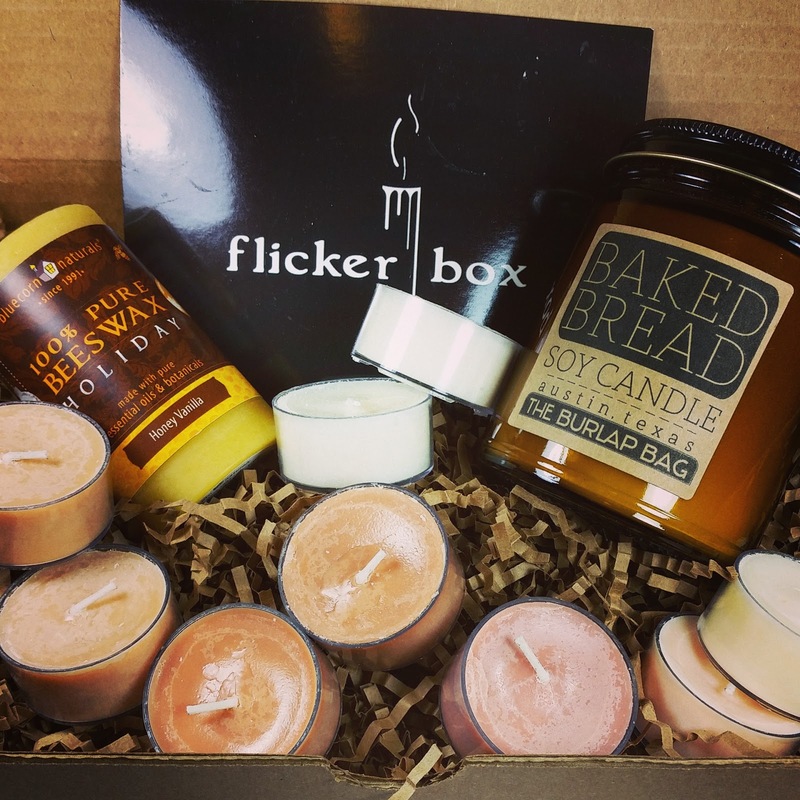 Flicker Box November 2014 - Going to Grandma's and Coupon Codes! I discovered this box on Gilt City and picked up a 3 month subscription for $59 with an additional $7 for shipping. So I paid about $20 a box. Which isn't bad considering how much good candles go for these days. Still, it's a lot of money and I do like to feel that it's worth it. So far it's been great! 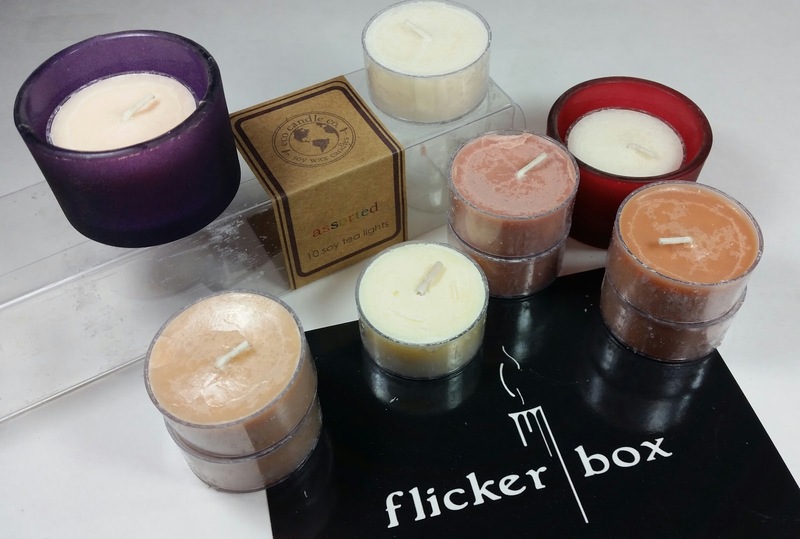 What You Get: A carefully curated box of all kinds of unique, handmade artisan candles. Bluecorn Naturals 100% Pure Beeswax Candle in Holiday Honey Vanilla- This is a small pillar candle, it's only three inches tall but because it's beeswax, it's got a 25 hour burn time. This is the kind of candle to burn when the power goes out. Too bad I didn't have this last month. If you put this up to your nose, it smells so good like honey that it makes my mouth water. However, I know that beeswax has sacrified throw for a long burn time so I don't expect to actually smell much once it gets burning. I hope I'm wrong about that. 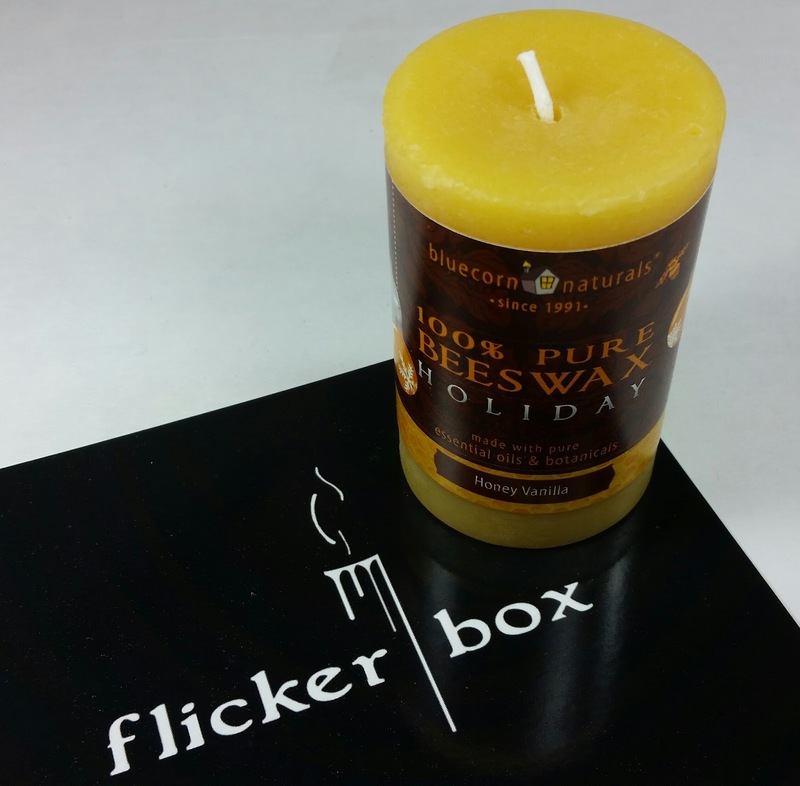 These candles are made in Colorado and use only 100% pure beeswax, vegetable waxes and pure essential oils. 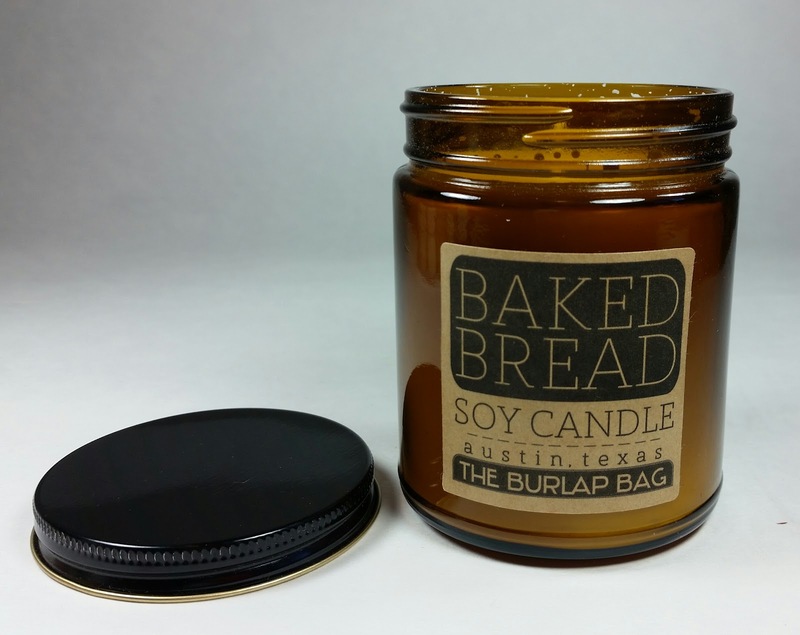 The Burlap Bag Soy Candle in Baked Bread- These are made in Austin, Texas and The Burlap Bag is a family business that loves making candles with interesting scents and funny names. This comes in a 9oz glass jar and has a 70 hour burn time. This is the weirdest scent! I don't know if it smells like baked bread to me but it definitely smells yeasty. It smells kinda like saltine crackers. Which... I love saltines so it's not a complaint. It's just the strangest smelling candle ever! I haven't lit it yet because I'm busy burning other ones but I'm definitely going to have to get it going sooner or later, just to see if it smells the same warm as it does cold. This company has a ton of candles with ridiculous names that sound like they would smell amaaazing! Hmm... Maybe I do need more candles. Unicorn Puke, anyone? Eco Candle Co Tealights-These are hand poured in Wisconsin and use natural soy for a clean burn. Each tealight has a burn time of four hours and there are five different scents! I think my favorite is Homesick which smells like apples, oatmeal, cinnamon and raspberry with a little vanilla. Warm vanilla-warm, creamy and rich vanilla. This smells like vanilla frosting to me. Mm! Oatmeal & honey-creamy and rich with a hint of almonds. Mouthwaterly delicious smelling! Pumpkin Latte-pumpkin and spices with fresh espresso and whipped cream. These have a great throw and one little tea light easily filled the living room with fragrance. They arrived quite messy but they were easy to clean up. The two tealight holders in this photo are my own. So anyway, yeah. LOVING this box! 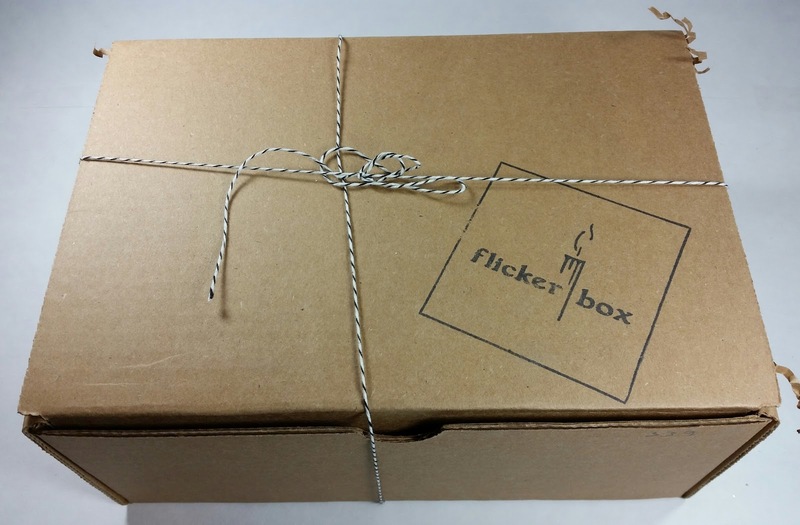 Flicker Box promises the the box will be worth at least the price you paid for it and that's $34/month (for regular subscribers- if you just try one box, it's $24). If you want to sign up for Flicker Box, you can get 10% off your 3, 6 or 12 month subscription with the coupon code: FAF339. Sign up here if you are interested! Baked bread would have been the first one I lit up - too weird to resist! The Eco Candle Co candles sound AMAZING but wax residue drives me nuts. I've had that happen to similarly packaged candles before. So maybe it's the packaging type? I'm glad it was soy, so it was easy to clean off with a cloth. I'm burning the Oatmeal Honey one right now. These tealights smell delicious. And the Baked Bread one IS so weird. I think it smells like saltine crackers but my husband doesn't agree. He says it smells like sourdough and doesn't smell like saltines at all. Haha! I guess I need to burn it and find out for real. Now that my bf KIND OF trusts me not to start a fire, I've been burning candles pretty much every night (because someone's gotta use up the DIY candle flops) and it's fun! I should go check out the Burlap Bag site. Unicorn Puke sounds like something I'd love. Because who doesn't want to smell rainbows and sunshine and sugar? Oh, you are so funny! I had to burn my flops, too! Turned out they only looked awful. They smelled great :D So it sounds like as long as you pick scents he likes and you don't burn down the house, you can make and burn candles all you want! Yay! Isn't it kind of unfair of you to write a review on something that you haven't actually used? You should at least light the Baked Bread candle before you review it. A candle's scent is what its intended to smell like when lit, not just when you sniff it unlit. The Baked Bread candle smells like a delicious bakery when you light it. The review is technically for the Flicker Box subscription, not necessarily each item you find in the box. I don't like to have all my candles lit at the same time so the Burlap Bag one has to wait :). It sounds like you've tried it, though, and like it. I'm glad to hear that and look forward to experiencing the scent when I get to it.